At the age of 9 he knew what he wanted to do with his life, and he never wavered from his goal. Now, he’s one of the world’s most famous scientists. He’s earned the title of “Most Powerful Nerd In The Universe” from National Public Radio and the title of “The World’s Sexiest Astrophysicist” from People Magazine. He was instrumental in cutting down the number of planets in our solar system, and in doing so upset entire generations who had come to love Pluto as the quirky, smallest planet. And who is this icon of science that’s recognizable by the general populace? … Neil deGrasse Tyson. Tyson was born in New York City in 1959 and grew up in the Bronx. His mother worked for the U.S. Department of Health, Education, and Welfare, and his father worked for the City of New York. Tyson was a star student at the Bronx High School of Science. Well before beginning at the Bronx High School of Science, Tyson had decided that science was the path he wanted to follow in life. 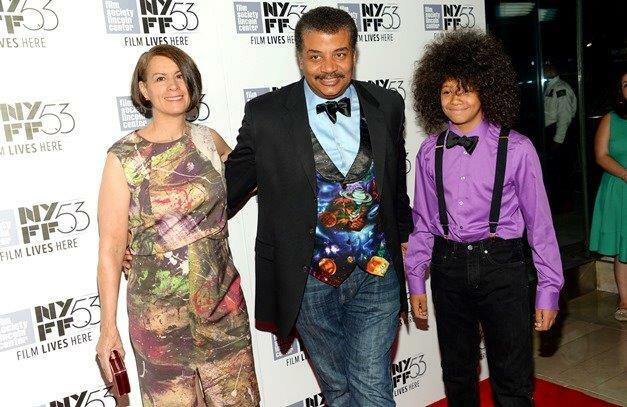 When he was in elementary school, Tyson’s class took a field trip to the Hayden Planetarium. While there, he felt that he was literally called to a career in science. Tyson immediately began committing time to his newfound interest – some might say obsession – and his time in high school showed his dedication to the study of the stars. While attending the Bronx High School of Science, Tyson was a wrestler but he devoted much time to his studies. He was the editor of the Physical Science Journal, and regular classes weren’t enough for him…he took classes at the very place that sparked his interest in astrophysics – the Hayden Planetarium. After school, he spent time observing the sky, moon, and stars from the roof of his New York home. 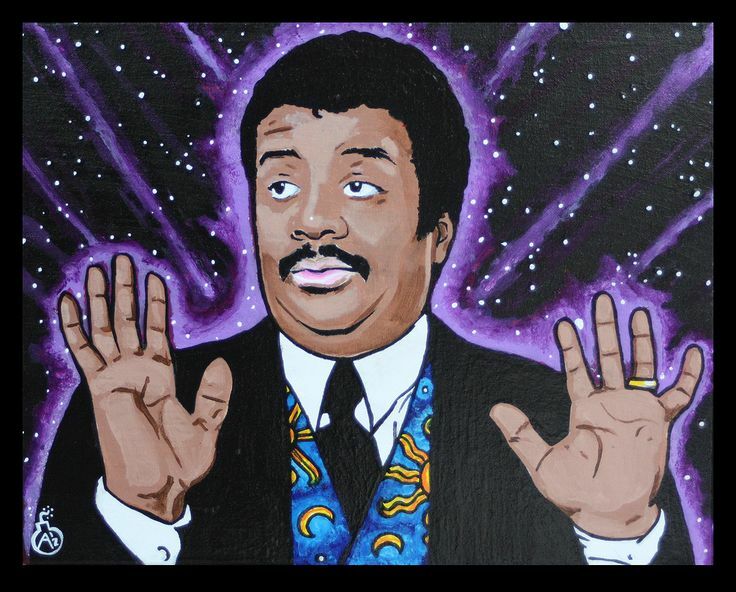 Neal deGrasse Tyson in his youth. His dedication to science and academics during his teenage years grabbed the attention of some prominent people. One, you may have heard of – Carl Sagan. When it came time for Tyson to apply to college, Cornell was among the schools he applied to. Sagan was a professor at Cornell, and the admissions office made sure he was sent a copy of Tyson’s application after they relieved the talent and potential that was within this aspiring scientist. Sagan was duly impressed by what Tyson had written in his application, so much so that he invited Tyson up to spend a day at Cornell. Tyson remembers that day in 1975 as one of the most formative in his life. Sagan died in 1996, and Tyson came into possession of his datebook which includes the notation “Neil Tyson” on the square for December 20, 1975. Tyson never forgot what he learned from Sagan that day, and the lessons he took back to the Bronx with him were about far more than the scientific method. A few months after his visit to Cornell, Tyson graduated from the Bronx High School of Science. Even though his visit with Sagan had a profound impact on his life, Tyson opted not to attend Cornell. But as an excellent student, he had no shortage of prominent schools to choose from. Though Cornell wasn’t the right fit for him, Harvard was. 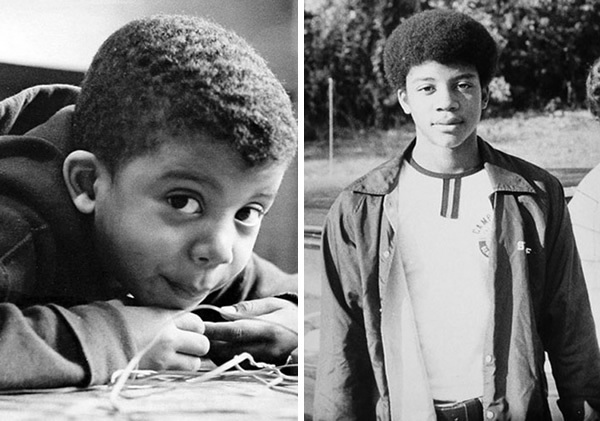 Astrophysicist and science evangelizer Neil deGrasse Tyson in his 1976 senior yearbook at the Bronx High School of Science, in the Bronx, New York. 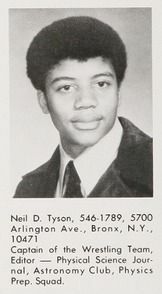 Tyson entered Harvard as an undergrad in the fall of 1976. As a student, he paid his tuition partially through grants and scholarships, but also through a work study program. Part of Tyson’s work requirement was to clean bathrooms on campus – including those of other students. On a Larry King Live appearance, he described the experience as “a little weird.” But he was willing to do it to pay his way through school and achieve his dreams. Working and studying physics weren’t enough to occupy the active and curious Tyson, though. He was on the crew team and the wrestling team while he was at Harvard, and was also a jazz, ballet, and Latin dancer. He graduated from Harvard in 1980 with a degree in physics, and kept his academic career moving forward with an acceptance to the University of Texas for a Master’s Program. He completed his M.A. in astronomy 1983, and he intended to pursue a doctorate from the college. But he hit a roadblock, and Tyson himself admits that the roadblock was largely of his own making. Looking back, he has admitted that he didn’t devote as much time to doing lab research during his graduate years as he should have and could have, and this prevented him from being able to go right from his Master’s program to earning a doctoral degree. He even had professors tell him to stop working in the field of astronomy. At one point, struggling as a student and broke, Tyson considered a very different job than that of professor or museum director. He thought about becoming an exotic dancer. He even went so far as to go to a show to see if he could do it. When the dancers came out and their skimpy undergarments were lit up as they gyrated to a rendition of “Great Balls of Fire,” Tyson decided that no matter how broke he was, exotic dancing wasn’t for him. Thankfully for the scientific community, Tyson’s break from academics was short-lived. With his undergraduate achievements and a start on a graduate degree, he was able to land a teaching job at the University of Maryland, and eventually found his way back onto the doctoral track in the Ivy Leagues. In 1991, fifteen years after scrubbing toilets to pay for his undergraduate degree, Tyson graduated from Columbia University with a doctorate in astrophysics. He then stayed in the Ivy League system, moving to Princeton for a postdoctoral position. 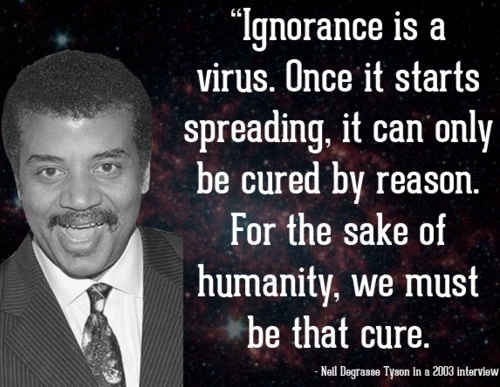 While he was earning his degrees and moving his way up the academic ladder, Tyson was publishing articles and writing a column for StarDate, a science magazine published by the University of Texas. While he was attending Columbia, he worked under a professor who was supportive of Tyson’s ambitions and intellect, applying for grants that gave Tyson access to the international astronomy community. Tyson traveled throughout Europe, attending meetings and learning from the best and brightest in the field around the world. And Tyson’s own star was starting to rise… soon after graduating from Columbia he landed his dream job … a position at the very Hayden Planetarium where his dreams had started. He started out as a staff scientist. It was only one year before he was named Acting Director of the planetarium. Then, only one more year until he was formally named the director of the Planetarium. Early on in his tenure as director, he made updating and modernizing the facility a keystone of his work at Hayden. The project was a 200 million dollar undertaking that gave the public a modernized, inviting look at the vastness of the universe. Tyson’s scientific work, as well as decisions he made about the Hayden Planetarium put him into the spotlight for the general public, well beyond just those in the scientific community. He became a household name because of one decision in particular. What did he do? He removed the planet of Pluto from the Planetarium’s solar system display. There are as many atoms in each molecule of your DNA as there are stars in the typical galaxy. This is true for dogs, and bears, and every living thing. We are, each of us, a little universe. Schoolchildren, parents, and scientists alike were not impressed with his decision. And soon became about more than that one Planetarium’s display. Pluto’s fate was taken up by an international organization…the International Astronomical Union. In August of 2006 the organization made their agreement with Tyson’s stance on Pluto official when they deemed Pluto a dwarf planet, officially knocking our solar system down to only 8 planets. Add to that, Pluto’s orbit is much more elongated than that of the other planets, and it’s so small that other planets have moons that are larger than Pluto. Though the Pluto decision was perhaps the most famous – some would say infamous – scientific assertion of Tyson’s career, he has published articles, essays, and books that discuss much more than the demotion of a planet. He wrote for Natural History magazine in the 90s, and his columns were turned into two different books, Death By Black Hole and Astrophysics for People in a Hurry. He chose the pen name of Merlin for himself when he wrote a column in the Star Date magazine, and those columns were also published as books. He hosted NovaScience Now in the mid-2000s, raising his profile even further to Americans. He was so popular as a host, that in 2014 the network brought him back to delve even further into science for the American people. The 2014 show gave Tyson the opportunity to build on the work of a man who had impacted him early on in his life…Carl Sagan. The show? Cosmos, a new version of the popular one that Sagan had hosted in 1980, based on his book of the same name. 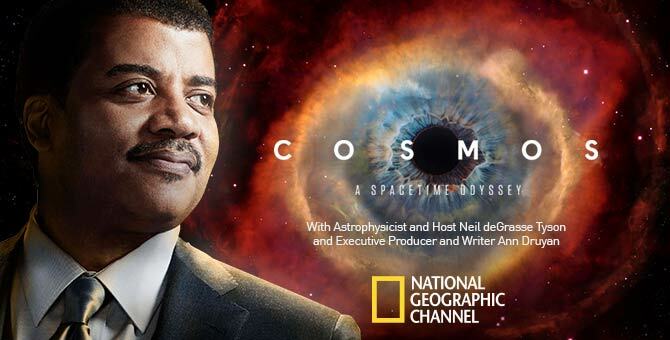 At the time of its airing in 1980, Cosmos was the most-watched show in the United States. If there was anyone who could live up to those kinds of expectations, it was Tyson. He didn’t have to go it alone in 2014, though. He had the help of Sagan’s widow, who worked as a writer for Cosmos, and the two made sure to include allusions to Sagan and his work throughout the rebooted series. The series was a success, and over 3 million Americans put their TV on Fox to catch the newest science lesson presented by Tyson every Sunday night for 13 weeks. The Cosmos reboot was undoubtedly successful, and showed Tyson’s appeal to the general populace. But his appeal in the media has gone well beyond direct, serious science. He’s appeared as a guest star on Family Guy, Brooklyn Nine-Nine, and as a character in New Ice Age. The Big Bang Theory, with its nerdy cast, of course welcomed Tyson on as a guest. He even made an appearance on Avenged Sevenfold’s album The Stage. He didn’t sing, but instead delivered a monologue during one of the band’s songs. A musical appearance that was rumored to happen, but never did, was that Tyson would appear on an album with Wu Tang Clan member GZA. Though the appearance didn’t happen, it speaks to Tyson’s breadth of talents and popularity that many people thought it was a very probable thing for Tyson to do. While the album didn’t happen, Tyson and GZA did appear together when GZA rapped on StarTalk. The Earth on the credits was spinning clockwise, when Earth really spins counter-clockwise. Though Tyson pointed it out to Stewart and the entire viewing audience, it wasn’t until Trevor Noah took over as host in 2015 that the show made a permanent correction to the Earth’s spinning direction. Tyson was excited about the change, and tweeted out his thanks to the Daily Show. The Daily Show’s globe isn’t the only correction that Tyson’s scientific knowledge has led to in the realm of pop culture. Remember the 1997 blockbuster movie Titanic? Tyson saw it – and he wasn’t impressed. Near the end, after the ship has sunk, Rose is lying on a board in the freezing Atlantic Ocean. She’s gazing up at the night sky, and the audience can see what she see’s – the stars in the sky over the ocean. When Tyson saw the scene, he noticed something the rest of us didn’t. The stars weren’t the right ones and weren’t the right arrangement for the year 1912, at the latitude and longitude where the Titanic sunk. So, as with the Daily Show, Tyson let director David Cameron know. According to Cameron, Tyson sent him a “snarky email” on the subject. Fifteen years after the film was first released, Cameron took Tyson’s suggestion and adjusted the night sky in that scene to be accurate. Titanic and the Daily Show weren’t enough for Tyson. He’s even had a hand in keeping Superman scientifically accurate. DC Comics wanted to feature the world’s most famous astrophysicist in a comic, but Tyson wouldn’t do it unless he could be sure of the accuracy. With the distance Krypton is supposed to be from the Earth, Tyson he would never be able to help Superman spot it, so what did he do? He did his research found an actual red star to serve as Krypton, and crafted a story whereby Superman would combine all the telescopes on Earth to be able to see Krypton. No media format has been untouched by Tyson. The man is everywhere, spreading the word of science, and the people of the world are listening. Creators and producers take his advice, and seek him out for appearances. Among scientists, he is unique in this kind of stardom. A serious scientist and a pop culture figure would seem to make any person interesting enough. But Tyson has hobbies and interests that go well beyond the mysteries of space and the sharing of science. He and his wife, Alice – who he met in a physics class – are both foodies. Tyson has said they probably spend too much money on food, but living in Manhattan they have so many restaurants to explore and so many food options to try out they take every opportunity they can to enjoy new foods. Tyson is a also wine connoisseur. His love of science plays a big role in his enjoyment of wine, helping him to understand why different wines taste different and how they can be best served. Like much else, Tyson explains these concepts simply so that non-scientists can understand them, too. And a rather well-known scientist is the source of Tyson’s favorite quote about food and wine…Galileo. Food, wine, physics … what’s left for him to care about and learn about? Calligraphy, for one. Tyson can create beautiful lettered art with a feather pen, but is especially passionate about fountain pens. He loves them so much that his wife spent 6,000 dollars to buy him a Japanese-made pen as a gift when he finalized the contract for his autobiography. He even gave an entire interview to the New York Times on the pen and his love of calligraphy. In the interview, he described his own mathematical theory behind how you can tell if a pen is perfect for calligraphy. Having to dip the pen to refresh the ink after 6 to 8 words mean you’re writing with a beautiful rhythm, he says. Perhaps this attitude is a large part of his success and why he is so beloved. For all his intelligence and his contributions to the study of space, Neil DeGrasse Tyson remains firmly planted with two feet on Earth.